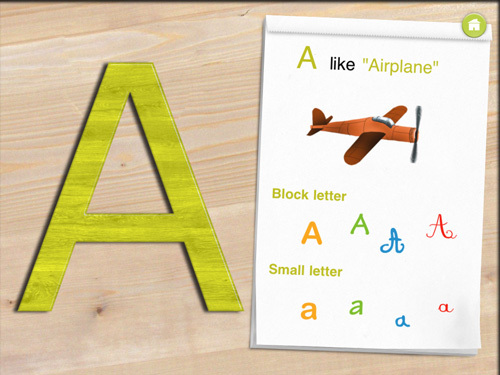 Alphabet – Learn and Play is a learning program for children on iOS devices. 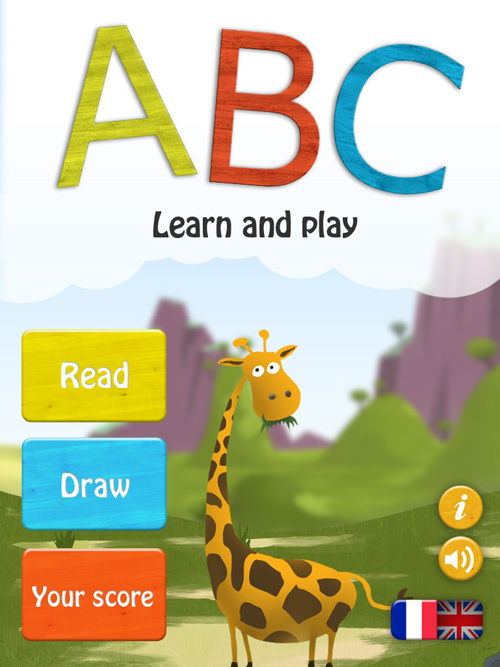 The premise of the game is to help young kids learn their alphabet. The application is designed to work in both English and French languages from the application itself. To switch language, simply use the French or British flag buttons on the main screen of the application. In either language, the application looks the same. An image represents each letter to help the child memorize the letter. The images describing each letter were carefully chosen to be universal in both languages. 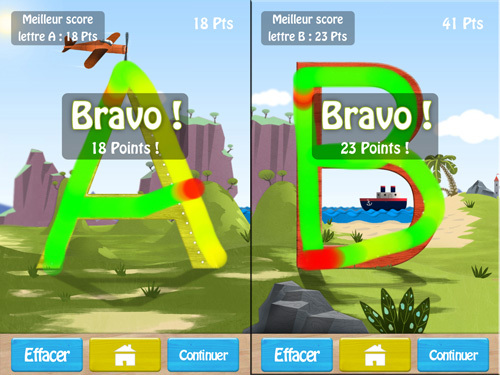 For example, A is Airplane or Avion, B is Boat or Bateau, up to Z, which is Zebra or Zèbre. A sound is also played to describe the image. For the Airplane, an airplane flying is heard, but there are flaws in some cases such as F which is Flower or Fleur: no sound! My main complaint is that the application does not provide any animation, which kids normally love. It would have been nice to have the airplane fly for instance. There are two main modes: Read and Draw. In Read mode, the child is taught how to pronounce each letter. In portrait mode, only the letter is spelled. When in landscape the application will spell the letter and give an example of a word beginning with that letter. For A, it will say “A like Airplane” (or “A comme Avion” in French). The landscape mode also shows the letter written in different form (typography) in either block or small letter. Draw mode is like a game that teaches the kid how to write the letters. This mode is in portrait only, and only teaches writing the capital letters. It would have been nice to include the small letter as well. By drawing the letters, the child gets points. But I deplore that it is only done in alphabetical order and in loop (A-Z-A-Z, etc.). The more the child does them, the more points he/she gets, but there is a missing challenge here: he/she won’t be able to compare his/her new score to previous performance. Because it is an application for a child, I tested it with some kids ages 8-10. The first time, they appreciated the application and played with it for maybe half an hour. After that time, they were interested in trying other games on my iPhone or iPad. They preferred it on the iPad for the larger screen, but it was usable on iPhone as well. The lack of challenge and animations did not help keep their interest for long. A few days later, they were requesting my iDevices, sometimes for this application, but most of the time for other games they discovered on them. While the app is well done, to make it really useful or attractive for children, adding a challenge in draw mode would certainly help keep their interest longer. Adding the small letters to the drawing mode should be a must as well.